who lives at Farm Sanctuary. 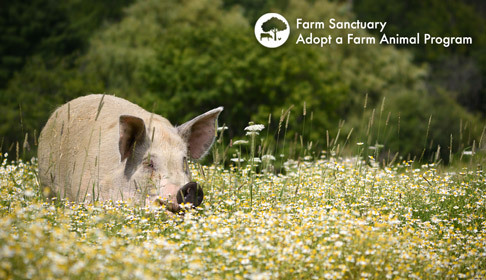 Upon receiving your donation, Farm Sanctuary will send you information about your OWN special farm animal friend, including his/her story, photograph, and details about your year-round visitation rights. *Note: Barnyard Adoptions include one hen, one rooster, and one of each other species. For sponsorships in Acton, CA, ducks and geese are no longer available for adoption. Barnyard sponsorships at our Acton Shelter will include a donkey in place of a duck and goose. I would like to sponsor an animal(s) at:. New adoptions take 2-3 weeks to process. If you are adopting an animal as a gift and would like your gift recipient to receive the adoption package by a certain date, please call us at 607-583-2225, ext. 225, or email sponsorship@farmsanctuary.org to make special arrangements. For rush orders, shipping costs may apply. NOTE: Automatic monthly or quarterly payments will be deducted continuously for a minimum of one year. Annual payments are not recurring. You may cancel your sponsorship at any time by contacting our office. Please send the sponsorship packet to me at the billing address. * Phone with area code: Required Phone number is required.